My garden has been looking glorious, I did a lot of work in winter, pruning, weeding, fertilizing and have reaped the rewards this spring. These photos are from my Mediterranean garden which is out the back, it’s the first part of my backyard with a low fence that separates it from the vege garden, it’s really to keep the dog out. I have developed this garden to be heat tolerant and picked plants that have low water requirements, I have irrigated this area with the brown dripper line and try to only water every 10 days in Summer. I mulch heavily and choose Forest Mulch from a local company called Jeffries, Its fine grade, natural looking mulch, full of composted organic matter that conditions your soil as well as reducing evaporation. I have loosely modeled this area on the gardens at Diggers and Lambley who also have nurseries and locally a great nursery in the hills called Tupelo Grove where I have purchased my plants over the years. The plants I have chosen have to look good to me, flower, be perennial, come from similar climates where the temperatures in summer exceed 40 degrees and have little rainfall. Helianthemum – a small spreading ground cover which loves the sun I have about 6 of them, lemon and pink. Achillea moonshine, green-grey feathery foliage which produces flat heads of yellow flowers. Perovskia blue spire again with grey foliage and purple flowers from Iran. Buddleia royal red, for the butterflies. Salvia Nemorosa – Lubbeca, clumping with fantastic blue spire flowers I have about 8 of them. Scabiosa or pinwheels, again for the butterflies, they are great filler plants. Cerastium – a grey ground cover with small white flowers this is in the foreground of my photos. Agastache – this is one of my favourite plants, the pink flowers last all spring and summer. Penstemon, i have a couple of red ones. I thinned out all of the fruit trees, looking for where buds had grown multiple fruit. I still do this when I walk past if I think they are too close together or a branch is hanging low. I pulled out all of the winter crops, broccoli that had finished flowering, of the 6 mini cabbage I planted I harvested 1 the rest were eaten by caterpillars or didn’t form heads. I have harvested some monster beets and lots of rhubarb and netted the strawberries leaving out the huge borage bush at the end of the strawberry patch. I am only just planting my summer crops, they have been waiting in the greenhouse, I am super late! We have been building a new fence out the front which has taken all of our time, it’s close to being finished just needs rendering and some posts which are out of my area of expertise so I’m free to go back to the garden, yay!! 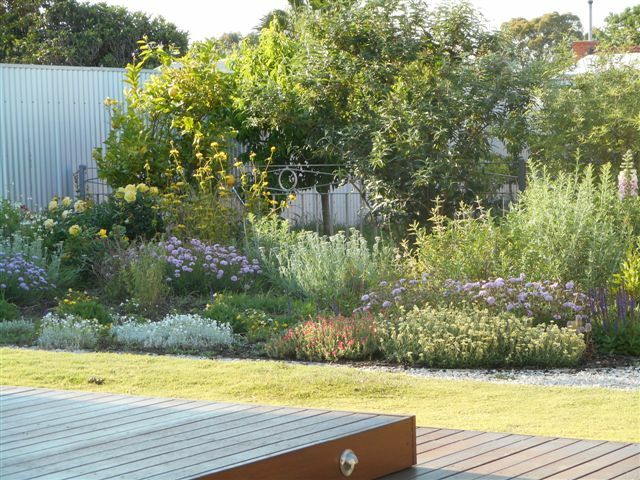 Hope your gardens are growing well and if you’re in Adelaide, some rain finally!! 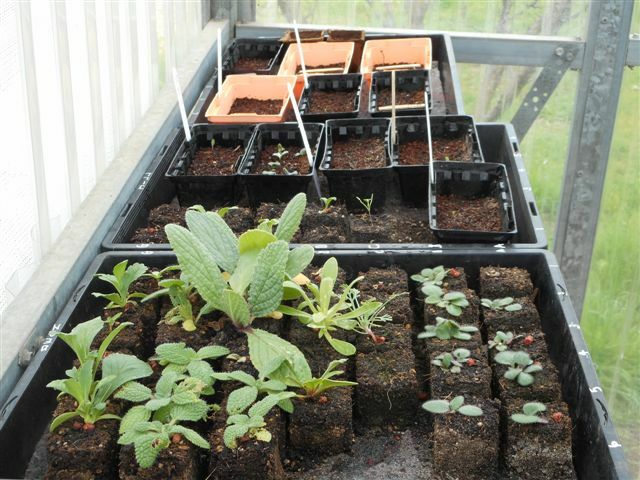 I started sowing seeds the last week of August, I have a heated mat in my workshop where I started the first tray of flower seedlings and have now moved them to the greenhouse. I started them off in the soil blocks I made and they have continued to do well, the block are half coir which helps with retaining moisture and not dry out too quickly. Lots of tomatoes and capsicums when they sprout!! My biggest challenge in the greenhouse is the radiating heat, we are only 2 weeks into spring and I have noticed that my newly sprouted seedlings and trays waiting to sprout have been drying out and have to be watered twice a day which is tricky. The entrance of the greenhouse faces north and will be shaded by the apricot tree when it comes into leaf the same with the western side, it’s shaded by the nectarine, there is a fence on the eastern and southern aspects. This weekend just gone Mr GH. has made 2 removable shade frames to help reduce the amount of sun and we have removed 2 panels in the western wall for more ventilation. The largest panel is on the western side and one for the roof, we used white shade cloth which is 50% UV block and being white it reflects the heat. I am really looking forward to seeing how it reduces that radiating heat over the coming months, making it possible to grow seedlings for longer in the greenhouse. Every month Julie hosts a review of her greenhouse and invites us all to share what is happening in ours, thanks for having a look. Welcome to my first greenhouse review, I have been inspired by Julie from Peonies & Posies who each month updates us on the happenings in her greenhouse. Julie and some of the other bloggers who share their greenhouses are from the Northern hemisphere where they would experience similar challenges with the cold as I do with the heat in my greenhouse. I remember when we moved to our home a greenhouse was one of the first things I wanted for my garden. I started off with a plastic greenhouse that got broken into by thieves looking for some ‘medicinal weeds’ another time there was a rat in there and the dog who was trying to get in had the plastic in her mouth and was tugging on it so violently made the shelves fall over with all of my newly sprouted seedlings. I can remember Mr.GH showing me the destruction when I got home and the efforts he had made to try and get the tiny seedlings back into the punnets knowing I would be upset. 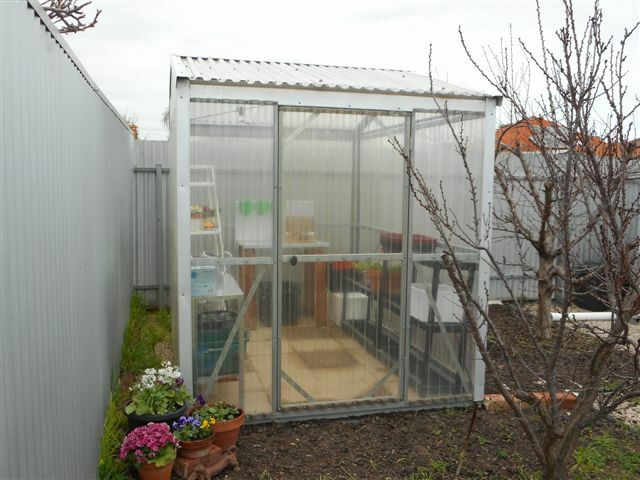 A new greenhouse was designed and built for me by Mr GH for me in 2009. He built it using salvaged steel for the frame and we clad it in clear polycarb sheets, this product reduces the heat transmission and provides protection from UV rays. 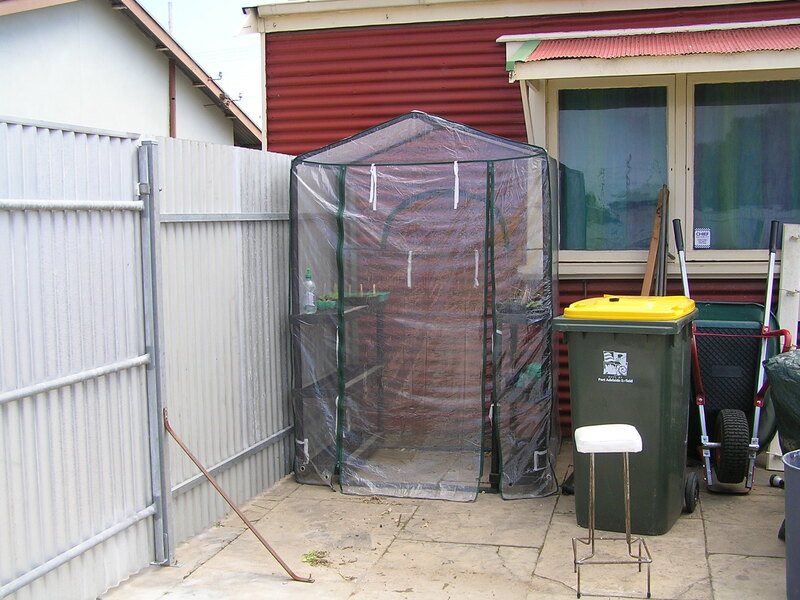 We placed the greenhouse in the right hand corner of the yard and the size is 2600 x 1900 x 2200. We have since moved the greenhouse to its new position which is on the left hand side of the yard, it is in the corner of the orchard now and gets more shade in summer from the peach and apricot tree’s. Heat is the biggest challenge for me with the greenhouse. We have just recently installed an automatic vent opener which has made a huge difference already in reducing the inside temperature, we will also install a louvre window in the bottom section of one of the walls for increased airflow for when the door is not open. The first thing I did was give it a good clean out as it had become a store area and get rid of most of the red back spiders, I salvaged a new white shelf that some-one kindly left out the front of their house, potted up some pretty polyanthus for colour for inside and outside some winter flowering annuals. I have moved the mint to the greenhouse we all know mint does not like the cold and it has bounced back beautifully and I have the first of my spring/summer seedlings in the greenhouse. I have 2 trays currently in the germination tray and will move them in once they have sprouted. Seeing and reading about other bloggers greenhouses has been a great inspiration for me, It has given me the motivation and determination to make my greenhouse more useful and find solutions to the challenges with the heat, thanks everyone! Here in the burbs we get one very cold snap of weather every winter and this is it at the moment, the one time every year where there is snow at Mount Lofty or Mt. Barker is happening now. 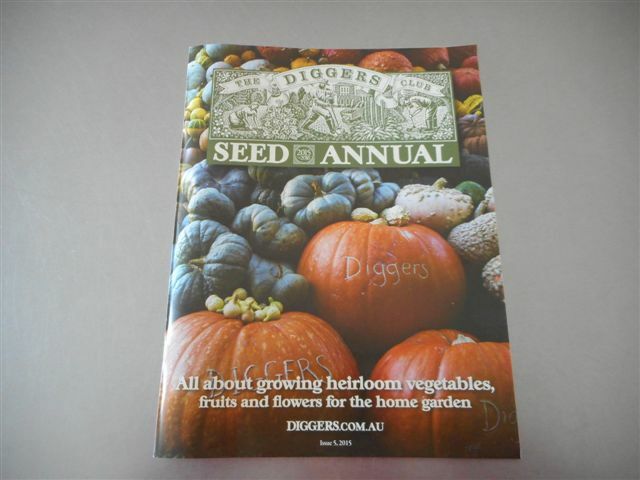 It started last week on Thursday, the same day I received my Diggers seed annual in the mail, whoo hoo!!! I was saved by Diggers. 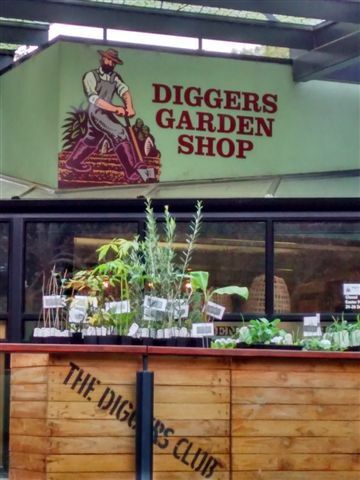 I decided Sunday was the best looking day to head over to the Diggers shop which is in our Botanical Gardens, we are very lucky to have a shop in our state otherwise it is mail order. Every day I would re-read the seed annual taking mental notes of what I wanted. It is a ritual for me, spreading it out over the days and then making the list on the Sunday morning. 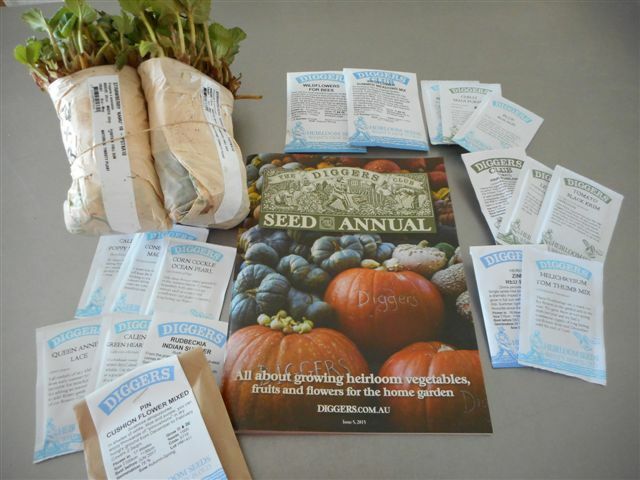 They were the only vege garden seeds I picked up they were all new releases for this year, I have plenty of everything else I need but I did get lots of flower seeds to attract more bees and other beneficial insects to the garden which I will inter-plant and I also want to do some meadow seeding. I also visited the new vege garden at the gardens, the tee-pee like structure is a resting spot there are tree stumps in there to sit on. The scarecrows look great and the winter veg was huge! It was a great day out and I’m feeling excited……. My vase from last week was ready for the compost today and I was ready for a new creation from my garden. I can remember years ago in winter buying little posies of herbs sprinkled with flowers and wanted to create something like that today. I decided it would be a working vase, a vase for the kitchen to pick from when needed. Thanks to Cathy for this great idea It is a challenge I am enjoying more each week. 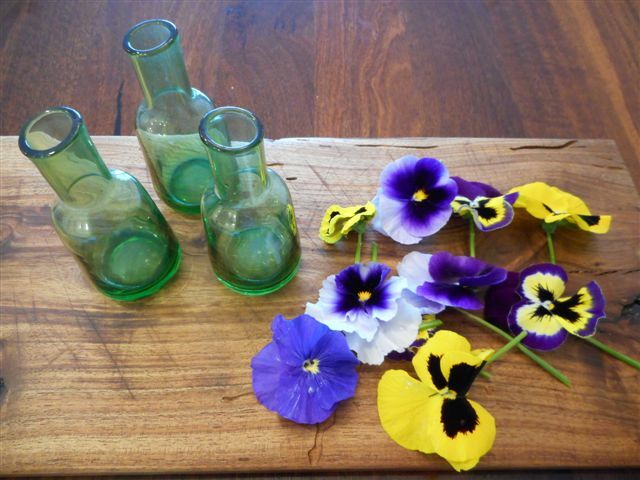 To see what others have in their vases head over to rambling in the garden. Each Monday, Cathy from Rambling in the garden invites us all to gather flowers and any other materials from our gardens and share them with each other. Jonquils are the first bulbs to flower in my garden they come up in early winter, I always feel excited when I see their green tips pushing up through the ground. I think the single flower head guys have a fairly ordinary flower but make up for it with their perfume, I have had them inside for an hour and the whole back of the house is filled with their sweet perfume. I have teamed them up with some branches of Perovskia ‘Blue Spire’ commonly known as Russian Sage. A deciduous perennial from the areas of Iran, Afghanistan and Pakistan which does well in dry areas. The foliage and stems are silvery grey with violet flowers, as it’s at the end of it’s season it has a lovely silvery look with the dried tiny flower heads still attached. I would love to see what you have found in your garden, head over to Cathy’s blog to see what others are sharing as well. 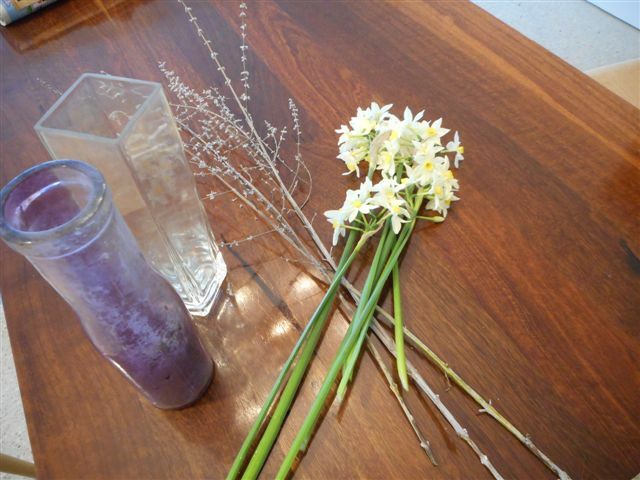 Pick some flowers from your garden and share them on your blog. Sounds easy enough! When I saw this meme last week on muddy boots and fingernails blog I was really looking forward to joining in. I love having flowers inside and all week have been looking at what I could have. 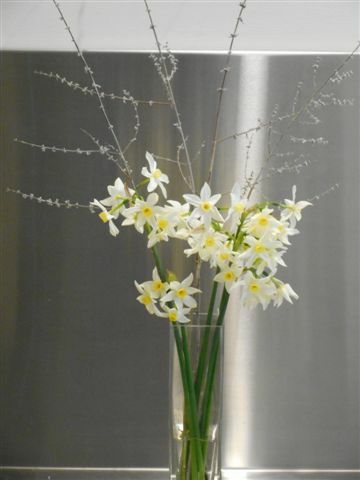 It’s winter here, the first jonquils are just opening up in some parts of the garden, most of the perennials have finished their displays so I had to rely on the winter flowering annuals. 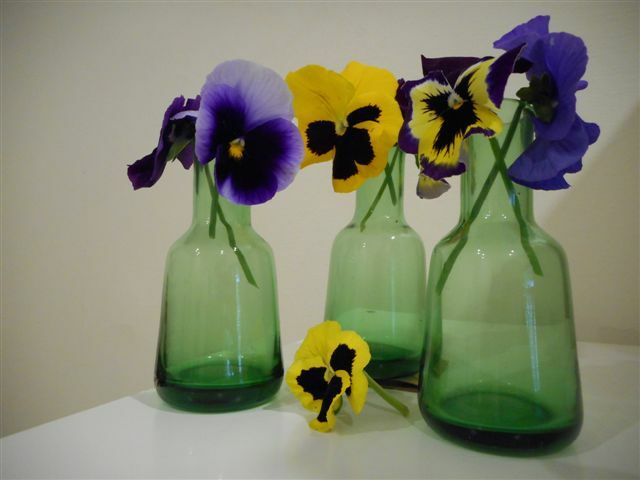 I was excited to start off with pansies, that was until I tried to get them looking good in a vase, their little heads have that tendency to bow down. I have a trio a mini vases that I am happy with. 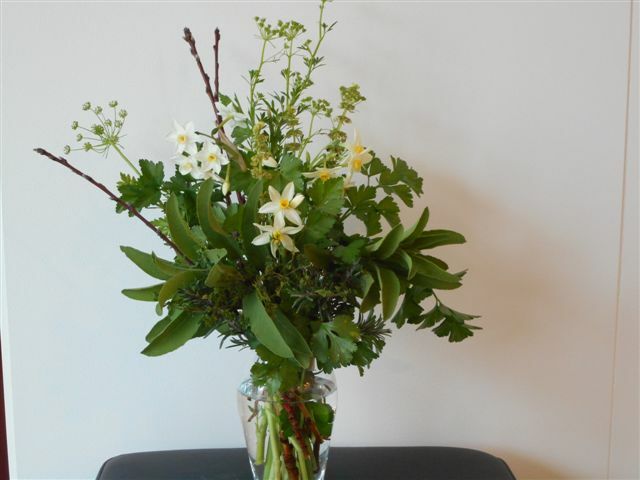 In a vase on a Monday is run by blogger rambling in the garden, would love to see what you have in your garden to bring inside. I am a passionate gardener and decided I wanted to provide more of the food my family eats. Gardening hands is my blog about my successes and failures in the garden.